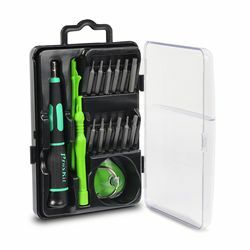 This portable tool kit includes all the necessary screwdriver bits and tools to perform your own repairs and upgrades on your Apple products. Non-marring prying paddles, polyoxymethylene opening levers and a suction cup allow you to open devices and lift glass screens without leaving a mark. Note: Smartphone components can be easily damaged. Tampering with your phone's components may void your warranty.